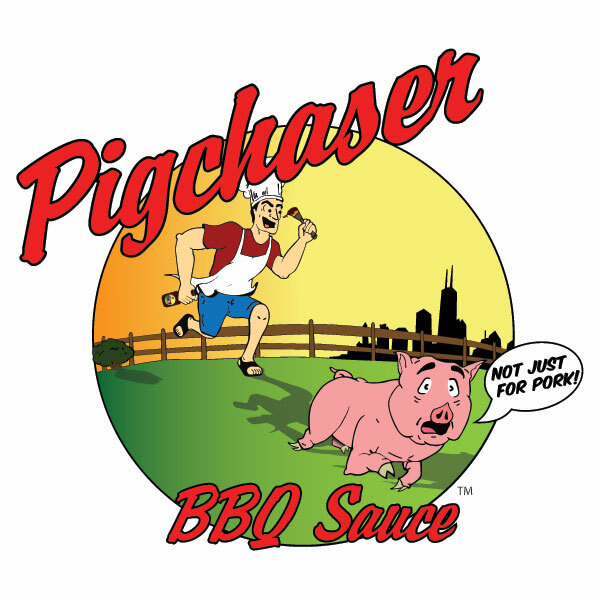 Pigchaser BBQ (Grayslake, IL) makes sweet, all natural sauces that are gaining recognition from some of the top contests in the country. With tomato bases and a sweet, smokey flavor profiles, Pigchaser sauces generally fall into the "Kansas City" style category. However, they've also taken a creative leap with their Pineapple Mango sauce. The concept for Pigchaser Pineapple Mango was conceived after the Pigchaser himself took a vacation to Hawaii. While visiting the island state, he dined on pork with pineapple and mango sauce at a luau. After returning to the mainland, the Pigchaser set out to re-create the experience and flavors he'd enjoyed in Hawaii. Pigchaser Pineapple Mango sauce starts with honey, mangos and tomatoes as its base ingredients. The already sweet foundation is enhanced with pineapple, brown sugar and maple syrup. It goes without saying that this sauce is ultra sweet. The honey is definitely the dominant flavor with the fruit acting as mild accents. There is no heat in Pineapple Mango, but there is an attempt to balance the sweetness with natural smoke flavor and savory spices. I first used Pigchaser Pineapple Mango on spareribs and later on smoked chicken quarters. Each time, I paired Pineapple Mango with a Caribbean inspired dry rub. The sweet sauce brushed on the meat easily and left a nice glossy shine. The sauce is slightly chunky, but still presented well on both the pork and poultry. When heated, the numerous sweet ingredients blend together. The honey flavor doesn't stand out quite as much. The sauce, however, remains incredibly sweet. It pairs very well with island inspired spice rubs. Pigchaser BBQ sauces are always among my top recommendations. They are especially good for Midwestern palates. The sweet, familiar flavors make these top shelf products real crowd pleasers. Pineapple Mango may stray from the formula a bit, but it's still an exceptional product. 0 Response to "Pigchaser Pineapple Mango"